Should I be plotting to retire to the Caribbean, considering sailing around the world in my 30's, or masterminding a business empire upon my escape from corporate America? Absent such grand plans, I often gave them a blank stare. I hope my kids have better plans than the younger me did then. But it's okay if they don't though I hope they save and invest anyway. I have always been a saver. So saving my money, investing in my future (whatever that might look like), and building wealth were not problems for me. I could do all of those things without having firm goals carefully aligned with my finances. In fact, I may be better off than many people my age: I have a paid-off mortgage and above-average retirement savings. Goals influence a time horizon. If investing for a specific purpose, I'd have a time frame for withdrawing my money. For example, I might want to use invested funds to make a down payment on a house or vacation home, pay for my child's college education, pay bills in retirement, or take a 50th wedding anniversary tour around the world. The number of years from now until the time I need my money is my time horizon. For example, when I was 25 years old and planning to retire at 65 years old, then my time horizon for retirement was 40 years. The longer my time horizon, the more I can accept fluctuations in the value of my investments earmarked for a certain goal. For example, if my time horizon for a house down payment is one year, then I may want to avoid the stock market altogether (because in one year, the market could easily go down and my investments decline in value) and sock away money in a savings account. But if my time frame for buying a new house is 7 years, then I might consider investing in the stock market for this goal because even if my investments declined dramatically in one or two years, there's time for potential recovery and growth in the subsequent five or six years. Time frames are typically linked to financial goals. Very often, I should have multiple time horizons for multiple financial goals. The time horizon for my goal influences my asset allocation. The closer I get to needing money invested to pay expenses, whether a home down payment, college, or retirement, the more I may want to minimize the fluctuation in the value of investments designated for these purposes. Similarly, the further away my goal in terms of years on the horizon, the more risk and fluctuation I may be able to accept. I know when I have reached my goal. “Are we there yet?” is a question I might ask myself when saving and investing for the future. The more clearly defined my goal, the better I can recognize when I have arrived or accumulated enough to reach this goal. At that point, I may spend the money that has grown, set new goals, or both. Not having firm goals has occasionally made me somewhat of a miser. I've learned that — even though having goals may seem restrictive — they give me freedom to spend. 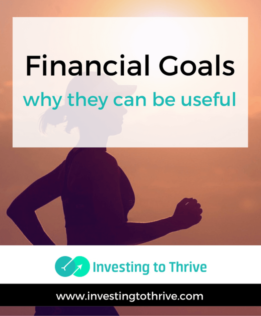 If I've reached my goals or are on track to reach them, I may be more likely to be comfortable spending on needs and wants now, rather than hoarding money for the future. I can calculate how much I need to save each month. Having goals, time horizons, and asset allocations can help me figure out how much to save each month to reach my objectives. For example, if I want to save $40,000 for a home down payment in 10 years and hope to make 8% each year in the stock market (an aspiration, but not a sure thing), then I should save $218.64 each month. (Use the PMT function in Excel or Google Sheets to perform this calculation). When making these calculations, I typically don't count on the market dropping say 30% one year and gaining 15% the next year. Typically, I land on an average return of say 8% and then do calculations from there. It's not a perfect system but it's helpful to have an interest rate as a starting point. As I save, invest, and experience real market returns (or declines), I can evaluate my progress and determine how much more (or less) I need to save to reach my goals. I can focus on reaching the goal, not winning at investing. As an investor, my focus ought to be on reaching a specific goal within a certain number of years. Nearly everything in our culture points us towards winning as a way of achieving our goals. We need to be the best to get the college scholarship, land the promotion, win the heart of our beloved, outbid the other couple on a house, etc. So, winning at investing seems natural. And just getting a bit more profit seems worth the effort (in terms of paying attention to stock market movements and stock valuations) to beat an imagined competitor. But with a goal, I can concentrate simply on reaching that goal and being satisfied with my progress. Goals can help me to manage risk. For me, reaching a goal should be more important than winning at investing, such as beating market performance. It's human nature, though, to want to reach that goal earlier than expected or with a bigger pile of cash than anticipated. So, I may take larger risks than necessary in hopes of getting a big win. As an age-group athlete, I've practiced this concept: when training, I focus on achieving a certain time or finishing a race of a certain distance (whether a 5K or a triathlon), not winning the race. I can't know with certainty who is going to show up for a race and how I might perform relative to the other competitors. By focusing on my personal goal, I'm less likely to make foolish decisions, like going out too fast, trying a new food right before the event, or changing my race strategy at the last minute. That is, I don't take unnecessary risks in my quest to win a race at the expense of missing my goal. And I'm pleased with hitting my goal, not whether I placed in the event or finished ahead (or behind) of a competitor. Investing toward a specific goal can be much like running with a specific goal. I may not stand on the podium at the end of the race but I'll achieve what I set out to accomplish. And if I set goals aggressively but appropriately, I'll be more likely to actually reach my goals. Financial goal setting can free me to pursue other, non-financial activities. If I have a goal that I'm steadily working toward and making progress, then I don't have to bother with accumulating more and more wealth. I can more readily establish and execute my plan, and then concern myself with other activities. What would I tell the younger me in regard to envisioning my life 10, 20, or 30 years from now? How should I have planned when unsure about my future? What goals should I have had? But what I learned is that absent specific goals, it's okay to invest anyway. It was okay to invest to build wealth. Investing just for the sake of investing offered me the following benefits: 1) it gave me experience investing so that when I got around to setting goals, I had a better idea of how I could reach those goals; 2) it equipped me with the knowledge to avoid investment scams; 3) it provided me with funds to start saving for a new goal. The money I set aside when I was younger was useful. Even though I didn't have a goal when I started investing, I have firmer ones now. And my purposeful older self is grateful to my younger aimless self for investing just for the sake of growing my money.